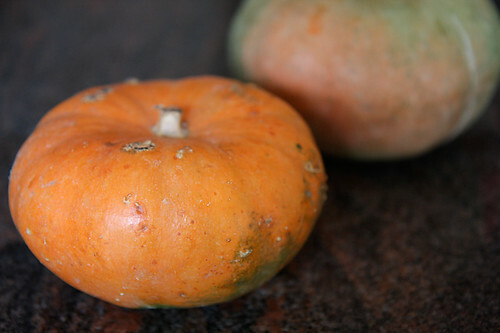 Pumpkins are available in India through the year and I use them in a number of traditional preparations. Whenever I cut a pumpkin, a pie made with it always came to my mind but somehow I was always intimidated with making a pumpkin pie. Reading this recipe made it sound and look approachable and delicious too. After all how could anything that had condensed milk not taste good? I don't think I can conceal my fondness for condensed milk delicacies. The number of cakes with condensed milk on divinetaste is testimony to this fact.In my humble opinion eggless cakes taste best when made with condensed milk. 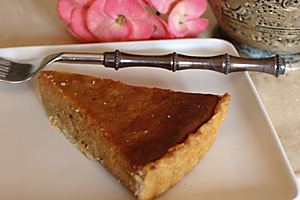 And when I stumbled upon this condensed milk pumpkin pie recipe in Cooking with Kurma, I couldn't wait to give it a go. Pumpkin Pie was one of the last dishes I made during my long stay at my parents place. 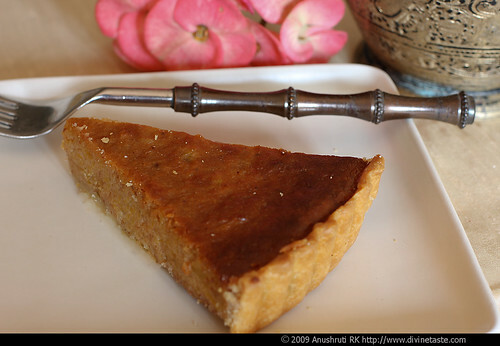 The pie top had baked to a beautiful golden brown colour and the crust was tender and light. We enjoyed it warm from the oven with a scoop of vanilla ice cream. Whipped cream or lightly sweetened yogurt would be my next try when I make pumpkin pie again. This recipe called for freshly-ground whole allspice berries. Since I didnt have them on hand, I substituted it with cinnamon, clove, nutmeg and dry ginger. Mix the flour with the salt and cut the cold butter into the flour using a pastry blender or with your fingers until you get coarse breadcrumbs. Alternatively, combine the flour, butter and salt in a food processor and process with 12-15 short bursts until it resembles coarse breadcrumbs. Put in the cold water and form into a soft dough. Do not handle the dough more than required at this stage. Gather the dough into a ball and chill well for an hour or two. Place the dough on a floured surface. Roll out the dough to a circle, approximately 12" in diameter to line a 22.5cm (9-inch) pie dish or tart pan with removable bottom. Prepare the edges and chill while you prepare the filling. Wow Anu..the pie looks lovely! My daughter has been asking me for this for quite some time. I could not find a proper vegan substitute for the taste! This certainly looks divine! You did an amazing job. The pie looks great! 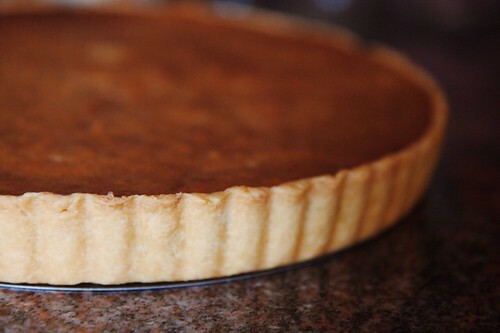 Beautiful, luscious pumpkin pie. Now I have to run and make one. It looks delicious! And what a perfect crust! Pumpkin pie looks totally delicious. And lovely pictures. Such a delicious looking pie… You just can't beat a classic like this. Hope you had a very happy holiday and new year! Can I ask what kind of oven you use? I live abroad but am returning to India soon and want to be sure I have a good oven. I also wanted to thank you for starting this blog! I have, so far, have successfully made your chocolate cake. Will try this one too. Such: I'm happy you like divinetaste. I have both an OTG and a Siemens built in oven. A wide range of excellent ovens are available in India. Thanks for the reply Anushruti. I don't think I could do without an oven, so it's reassuring to know. Looks like a wonderful recipe I hope to be able to try it and linked to it for my readers. Miss P: This might have been posted ages ago, but getting feedback even on an old post makes me happy. Thank your for your comment. Hope your pie was a success! This pie looks fantastic. Just wondering if the cornflour and condensed milk is supposed to be whisked in with the pumpkin purée or is there any cooking involved. Just came across your blog and I must say your concoctions look so luscious and professional. Sylvia: Thank you for your wonderful words. Yes, you need to mix in the condensed milk and the cornflour into the pumpkin puree and pour it into the prepared crust and then bake. No cooking before that. wish u and ur family a happy new year. I made this pie on the new year's day! oh man..im devouring it! its lovely! thanks again for such wonderful eggless recipes..keep going! I planned on making my regular pumpkin pie recipe today and then discovered I had no eggs, and I can't get to the store until tomorow. Your recipe looks so wonderful and I'm going to try it! Kitty: Hope you tried and liked this pie! Wendy: Congratulations on your new home! Hope this works well for you! I'm wondering if I can substitute whole soy milk for the condensed milk and still get a good texture. Help ! My daughter is on a trial to avoid milk products AND eggs. thanks for a quick reply if possible. sherry: The condensed milk would be sweeter and thicker that whole soy milk so I suggest using 200 gm soy milk, 200 gm tofu and additional sugar to substitute the 400 gm condensed milk. It should work very well. I'm an American expat living in Sweden and this was my 9th Thanksgiving outside of the US and the first time I decided to make pumpkin pie. I never made one before because my husband is allergic to eggs, and I never made ANY pie before anyway so I was intimidated. But I found your recipe last week and I made the pie today and it was AMAZING! It was the first pumpkin pie I've had in 9 years and it tasted just like the pies I remembered. Also, the consistency of the was exactly as it should be and the crust was perfect. And I was amazed that the first pie I ever made came out so well! The only alterations I had to make was to add a bit more flour to the dough when I was making it yesterday because it ended up being very sticky. And I ended up having to cook the pie for an hour instead of 40 minutes. But it all came out brilliantly. Irma: How nice to know that your pie came out good! So happy you enjoyed it. I tried my hand at this and the pie came out to be absolutely delicious. It practically disappeared from the plate. Ever since I made it for a get-together with frens here, they've been raving about it…thanks a lot for such a wonderful recipe. Garima: Nice to hear that! Glad that you and your friends enjoyed it. Anu: Your comment made my day! Thank you for the inspiration and the good wishes…I need loads of it! Hope to hear from you again. Will surely keep your recipe requests in mind. For the blueberry pie, can I just use blueberry puree instead of pumpkin puree?? Aanchal: You can try.Let me know how you liked it. I'm so glad I found your site. My daughter is highly allergic to eggs. I will be visiting this site often. Thank you! I tried your recepie. it really turned out great!! My family loves it! Keep it up! I found this recipe while searching for a "real-food" eggless pumpkin pie for my son who is allergic to eggs. So many recipes use replacements that aren't very appetizing. This recipe ended up being the best pumpkin pie I've ever had. He's asking for it again this year, and even said he wants it for his birthday. Thank you for the great blog and recipes. Being able to make traditional holiday foods for a young boy with allergies is a real blessing. thank you for beautiful recipes – I want to try it for our Thanksgiving dinner – do you think I could substitute kuzu for the cornstarch? abby: Never worked with kuzu before so I'm sorry I cant help. Cornstarch is easily available but if you dont want to use it arrowroot powder is a good substitute. Just made this and had a slice fresh out of the oven. It's luscious! The only change I made was to use allspice as that was what I had on hand. Thank you for the lovely recipe! First of all thanks a lot for posting this recipe. It's amazing! Second I know I'm posting this literally years after your post so I really really hope you will read and reply to me!! !- I just made this pie and its' so difficult getting it to set! I baked it for several more minutes than prescribed but the filling still sticks to the knife and even though it might have cooked it feels like it's sticky still! How do I fix this? Would chilling the pie overnight allow it to become more firm? Help! Amita: Try chilling the pie overnight. It should help. The knife need not come clean like a cake in a pie. Hope this helps. dear anu,each time i open my laptop the first thing i do is to go into ur website,not for the recipes only but ur pictures and stories are like a breath of fresh air into my otherwise mundane life.thank a million!!!!! Shruthi: Thanks for your wonderful words. They made my day! This recipe can be found in 'Cooking with Kurma' by Kurma Dasa.It's filled with many vegetarian recipes. Well worth acquiring. I love this recipe! This is my goto recipe for Thanksgiving pumpkin pie, as my wife is allergic to eggs. joel Jones- Thank you so much for the feedback. So happy to hear this! Thank you for this wonderful recipe. I tried it, but my pie crust remained uncooked even after the top was browned. what did I do wrong? Did you put the pie in the centre of the oven? And was your oven heating from the bottom as well as the top? Hi Anushruti..lovely website..came across it recently..just wanted to know if the pumpkin purée can be made by pressure cooking it ? All the best for your lovely website..
Pooja- Welcome to divinetaste! Yes you can puree the pumpkin by pressure cooking it. For a more intense flavour you need to roast the pumpkin in an oven. Pooja- Thanks so much for your kind words. how big is your tart pan?